It’s about time I start writing about choreographers. Last night was again a sleepless one, and I spent hours watching different stagings and performances of La Dame aux Camélias, choreographed by Neumeier. Conclusion? all performances are beautiful, no exception. La Dame has such a lovely and expressive choreography, on such lovely music – it may even be performed (and sometimes is) by dancers that have not that great technical or acting skills – it doesn’t matter, its beauty is impossible to spoil. There, I believe, resides Neumeier’s greatness: what he creates has a life of its own, his choreographies are in themselves objets d´art. They can be shown in a better light, when performed by great dancers (and then they become a regular WOOOW affair! ), but their magic does not depend on dancers as some other works do – it’s the other way round, his works HELP dancers make a great perfomance. ***** Ok, Neumeier, give me your feet so I can kiss them! Photo: Nijinsky…………. 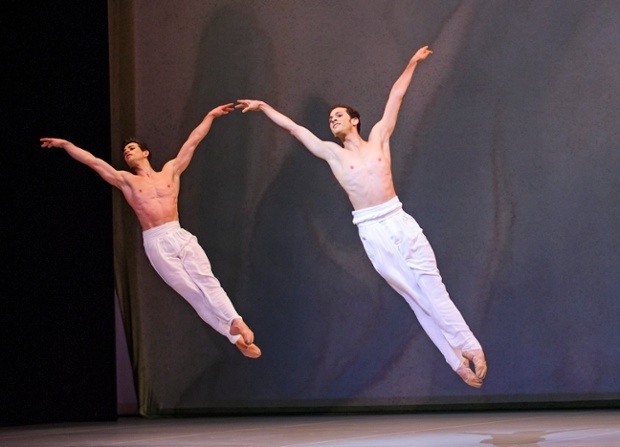 Link: the Bubenicec brothers Jiri and Otto as Nijinsky, and Anna Polikarpova as Nijinsky’s wife – a must see! Most are at once lyrical and like sandpaper on soft skin – a tenderly done punch in your stomach. The Little Mermaid he created: of course! he is so right in the way he depicts her – in my mind (and heart) she is not, any more, like the lovely drawing in my Andersen book, but looks and behaves like Yuan Yuan Tan – and stands for anyone who feels alien and fragil in a strange hard world. He makes you ache inside… and keep wishing for more. His works are often explicitely sensual, and no way to go around that – prude ballet-lovers are advised to stay away, sexuality is definitely there, under bright spotlight… I recently saw a performance where Margherite and Armand just suggest the (choreographed!!) kisses in their PDDs, as if they were dancing a virginal Nutcracker instead of a courtisane‘s passionate story… I almost can see the frown on Neumeier’s brow! Male dancers have lots of wonderful opportunities, sometimes more than women, but ultimately which gender gets more to do – and spotlight – depends on the subject and the plot – it is just one more example of his honesty when choreographing. But there are things I don’t like: in his stagings (he is keen on them, sometimes they are his own design), costumes are often unnecessarily ugly and unbecoming, and I highlight unnecessarily – AND not always easy to dance with. Costumes should never, NEVER be a problem to a dancer. I know you are thinking about the Mermaid, but even in La Dame those full skirts of Margherite, pretty as they are, are inadequate to the kind of complicated lift often used in the choreography. All that fabric is always in the way, or end up in a ball around her throat, or completely blind poor Armand… And then that napkin that is Joseph’s costume… or did they wash the thing and it shrinked to half its size? In Ivan Vasiliev it would look like a tie! Also, when he goes really contemporary, the choreography is somewhat less pleasing to the (my) eye than in his a little more traditional ones. UPS! These last paragraphs sounded like an unsophisticated, or worse, uncultured critic, didn’t they? In my original text, at this point I started a sidetrack to justify my apparently close-minded opinions. But the thing became too long (once again), and I turned the whole sidetrack into an independent post (soon) . It was a comment on contemporary choreography, anyway, not on Neumeier himself – and if you don’t know me, don’t get the wrong impression: I love contemporary! Never mind these “dislikes”, however, they are triffles that don’t make a dent in my admiration – he is placed VERY high on my Hall of Fame. On my wishlist are also the updatings he made of several classics – but these I didn’t see, so I have no opinion on them, yet (was that a relieved sigh from you?!? ).